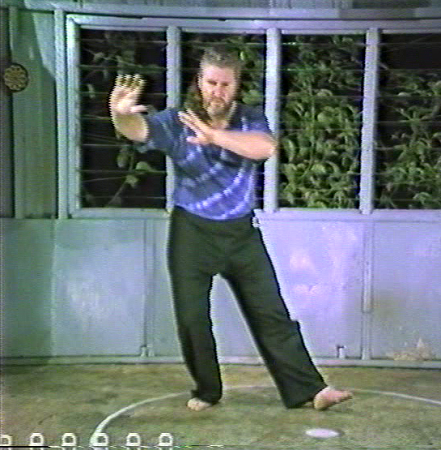 This is THE Video on advanced Taijiquan. This one includes the very advanced fourth level of both the old and new Yang styles and they are done all the way through non stop showing the very important OPENING AND CLOSING postures. The 'opening' and 'closing' movements are also called 'yin and yang' movements. The whole body must be in a balanced state of yin and yang not only the weight distribution on the legs. This tape shows you how to gain that internal balance. It can be used by any Taiji stylist to learn about the advanced methods of form practice. Also on this video are the Taiji applications of the postures in DIM-MAK. Every movement in Taijiquan means something where dim-mak is concerned. Every tiny movement is either a full dim-mak strike or included in a combination of strikes. As well, the twelve secret circular palm techniques are included. These are probably the most deadly hand techniques of any martial art. These were taught on Wudang Mountain as a precursor to the very secret "Qi Disruptive Forms" of which there are 12.